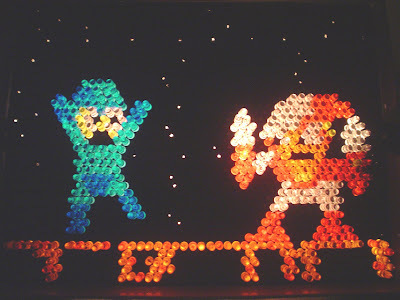 JoJo's Lite Brite Emporium: Megaman VS. Crashman!!! It's ridiculously hard to create detailed characters with the limitations of lite brite, but here's a replica of the boss room in crash man's level from mega man 2 as best as I could do it justice in colored plastic pegs. Also note that my camera majorly fucks up the colors when I take pictures of it! Something with the glare of the lite shining through makes everything look all washed out, but alas, without further ado, here it is! I think you could make a nifty full-scale model of mega man without having to sacrifice the quality of the original sprite. I mean, a whole lite brite with mega man jumping, or something.